Configuring Windows Server 2012 as an iSCSI Target SAN in a Two Host Failover Cluster Part 5 | Chinny Chukwudozie, Cloud Solutions. As it turns out, I already have two Virtual machines running on one of the cluster nodes. I set these up before the cluster creation. The VMs are currently not cluster roles/resources. 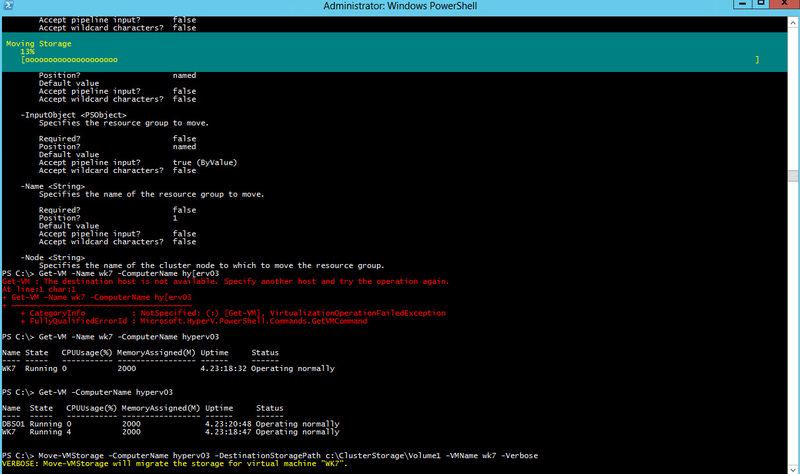 I will go ahead and make one of the VMs (WK7) a cluster role by adding it to the cluster. The next cmdlet adds the WK7 Virtual machine to the cluster. VERBOSE: Move-VMStorage will migrate the storage for virtual machine “WK7”. In the next step, we will create a new Virtual machine role and setup a Hyper-v Replica Broker to enable us replicate a VM to a machine outside the cluster. This entry was posted in Cluster Shared Volume, CSV, Failover Cluster, Hyper-v, ISCSI, ISCSI Initiator, ISCSI Target, Microsoft Hyper-v, PowerShell, PowerShell 3.0, Quorum, Virtual Machines, Witness and tagged Clusters, Hyper-v, Initiator, ISCSI, Virtual Machine, WS 2012. Bookmark the permalink.